OK, so that’s a working title. I wanted something to go with Brit with the Pink Hair (book one), which I’m not 100% sold on yet either. We shall see. Naming things is hard. Camp NaNoWriMo last month went better than usual! I hit my goal of 25,000 words for the month of April. I’ll absolutely be participating again in July to either finish up book one or two, or start writing book three. Obviously, no decisions have been made yet. It’ll all depend on whether I make any progress between now and then. Maybe I’ll give JuNoWriMo a shot too? My goal is to be ready to publish book one by the end of the year. If I say that here, hopefully that’ll make it official. Anyway, to the words! This is the moment Mike and Sharnita finally meet. 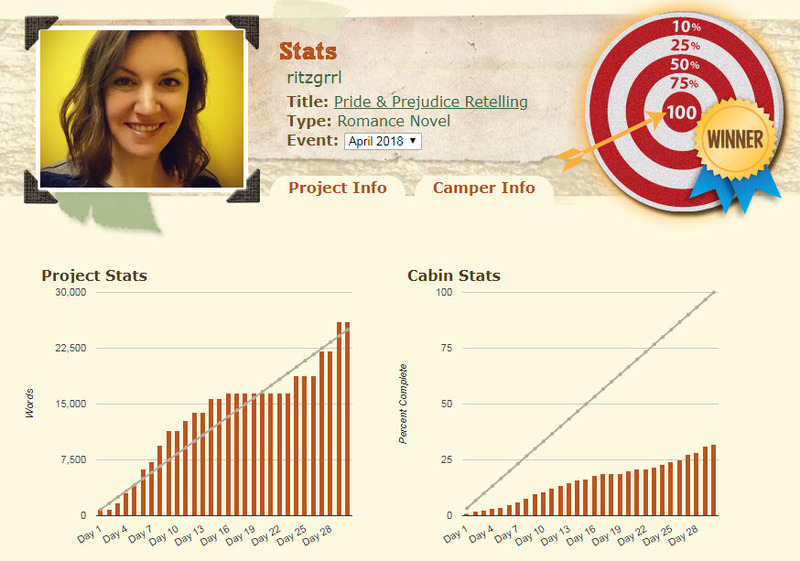 So far, all of my novels have been NaNoWriMo or Camp Nano projects. The healthy competition, the camaraderie, the deadlines, and the achievable daily goals create my perfect writing environment that I haven’t been able to replicate other months of the year. I take that back, I haven’t actually “won” at Camp yet, but then again I haven’t “lost” at NaNoWriMo in November yet either. So I guess I only have my stuff together in November. But Nano, I just can’t quit you, so I keep trying to succeed at Camp in April and July. This April, I’m setting my goal at 25,000 words to get started on the first draft of my next Jane Austen retelling. My plan is to have three books written, in some draft form at least, before I release the first one. As I’ve mentioned before, the first book is the story of Emma. This next one will be Pride and Prejudice, and finally Persuasion with overlapping characters in each book. Speaking of Jane Austen, if you’re in the mood for something goofy, I started an Instagram account with colorfully rendered Austen characters and quotes. Read on for an excerpt from the first book introducing “Mr. Darcy” and “Elizabeth Bennet,” who will be (unless I change my mind) club manager Mike and Dominican-Canadian bartender Sharnita in this story.